This book introduces a customer-centered approach to business by showing how data gathered from people while they work can drive the definition of a product or process while supporting the needs of teams and their organizations. This is a practical, hands-on guide for anyone trying to design systems that reflect the way customers want to do their work. 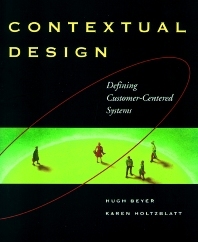 The authors developed Contextual Design, the method discussed here, through their work with teams struggling to design products and internal systems. In this book, you'll find the underlying principles of the method and how to apply them to different problems, constraints, and organizational situations. Karen Holtzblatt is a co-founder of InContext Enterprises, Inc., a firm that works with companies, coaching teams to design products, product strategies, and information systems from customer data. Karen Holtzblatt developed the Contextual Inquiry field data gathering technique that forms the core of Contextual Design and is now taught and used world-wide. Hugh Beyer is a co-founder of InContext Enterprises, Inc., a firm that works with companies, coaching teams to design products, product strategies, and information systems from customer data. Hugh Beyer has pioneered the link between the customer-centered front end and object-oriented design.